A Paris appeals court on Tuesday overturned terror convictions for five former Guantanamo inmates, ruling that French intelligence officials improperly questioned them while they were in U.S. custody. The men, who were arrested in Afghanistan in 2001, were interrogated at Guantanamo by French counterintelligence agents in 2002 and 2004. Overturning their convictions, the court ruled that the French counterintelligence agency DST could not be both a spy agency and a judicial police service - the body that under French law is authorized to interrogate detainees. The court refused "to let it be said that a police agency could question people detained on foreign territory in conditions that go against international conventions," said Paul-Albert Iwens, an attorney for Ridouane Khalid. Khalid, along with Brahim Yadel, Khaled ben Mustafa, Nizar Sassi and Mourad Benchellali, spent at least two years in U.S. custody at Guantanamo. 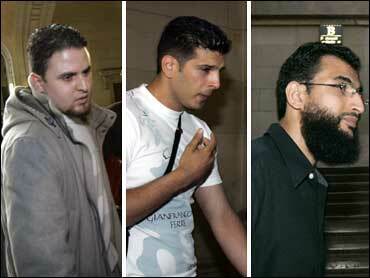 After they were returned to France, a Paris criminal court in 2007 convicted them of "criminal association with a terrorist enterprise," a broad charge often used in terror cases. They were given three- and four-year suspended sentences and were each sentenced to one year in prison. But because they had served the time before the trial, they did not return to prison following the sentencing. During their 2007 Paris trial, the five acknowledged having spent time in military training camps in Afghanistan but they said they had never put their combat skills to use.